Author(s): Maria Fernandez-Ibieta, Pediatric Surgery and Urology, Hospital CUV Arrixaca, Murcia, Spain. Lidia Ayuso-Gonzalez. 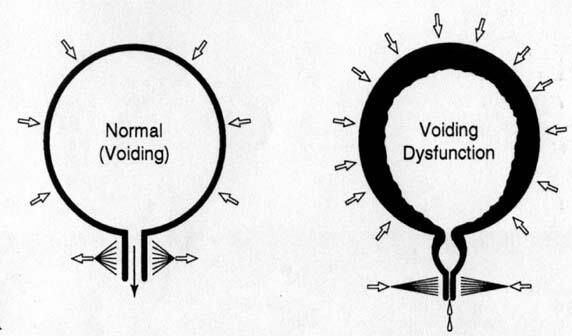 In Dysfunctional Voiding (DV), the external urethral sphincter or pelvic diaphragm (consisting of striated muscle) contracts during voiding, contrary to normal physiological mechanism. In Flowmetry plus pelvic Electromyography (EMG), the perineal surface electrodes will show a persistent activity during voiding. The cause is believed to be the persistence of an immature bladder control. The overall prevalence of DV is estimated between 7 and 11% of girls of school age. Symptoms of DV comprise a range of symptoms, deriving from outlet obstruction, incomplete voiding and elevated Post Micturition Residual (PMR): from daytime urine leaks, nocturnal enuresis, Urinary Tract Infections (UTI), or Vesicoureteral reflux (VUR), to the final decompensation of upper urinary tract in extreme cases. The literature reflects a high prevalence of constipation among these patients: between 33 and 56% of dysfunctional voiders are constipated. Initially, therapy of functional voiding disorders such as DV, comprises a series of fundamental principles called Urotherapy or voiding re-education. Currently, Urinary animated Biofeedback (Bfb) is the treatment modality of choice. This therapy discloses patients their own physiological and muscular mechanisms. Majority of the studies on Bfb efficacy reflect an improvement/ cure rate of around 70-80%. Initial flowmetric improvement followed by symptom relief or clinical improvement as the Bfb sessions continue, is likely to occur. It has been observed that there are two variables associated with clinical success of Bfb in DV syndrome: the absence of PMR at the end of treatment and an adequate or even aggressive constipation management. Keywords: Biofeedback, dysfunctional voiding, functional urology, incontinence, pediatric urology, urinary leaks, urinary tract infections. Affiliation:Pediatric Surgery and Urology, Hospital CUV Arrixaca, Murcia, Spain. Keywords:Biofeedback, dysfunctional voiding, functional urology, incontinence, pediatric urology, urinary leaks, urinary tract infections. Abstract:In Dysfunctional Voiding (DV), the external urethral sphincter or pelvic diaphragm (consisting of striated muscle) contracts during voiding, contrary to normal physiological mechanism. In Flowmetry plus pelvic Electromyography (EMG), the perineal surface electrodes will show a persistent activity during voiding. The cause is believed to be the persistence of an immature bladder control. The overall prevalence of DV is estimated between 7 and 11% of girls of school age. Symptoms of DV comprise a range of symptoms, deriving from outlet obstruction, incomplete voiding and elevated Post Micturition Residual (PMR): from daytime urine leaks, nocturnal enuresis, Urinary Tract Infections (UTI), or Vesicoureteral reflux (VUR), to the final decompensation of upper urinary tract in extreme cases. The literature reflects a high prevalence of constipation among these patients: between 33 and 56% of dysfunctional voiders are constipated. Initially, therapy of functional voiding disorders such as DV, comprises a series of fundamental principles called Urotherapy or voiding re-education. Currently, Urinary animated Biofeedback (Bfb) is the treatment modality of choice. This therapy discloses patients their own physiological and muscular mechanisms. Majority of the studies on Bfb efficacy reflect an improvement/ cure rate of around 70-80%. Initial flowmetric improvement followed by symptom relief or clinical improvement as the Bfb sessions continue, is likely to occur. It has been observed that there are two variables associated with clinical success of Bfb in DV syndrome: the absence of PMR at the end of treatment and an adequate or even aggressive constipation management.